After nearly 12 months of downtime, Neverforum has been reopened. Nevercorner.net, the site that generously hosted the Neverforum, the Nevertable and the Neverwiki for over ten years, has shut down today. An effort is underway to provide a new place of discussion for the Neverball community. In the mean time, see you on Reddit, Steam or Github (links below). Neverball 1.6.0 is out now! Get it from the download page and have a look at the release notes. Long-time contributor Cheeseness has put together a poster and an introductory video to celebrate the release. We also have a video on Oculus Rift support from Robert Kooima, the lead developer of Neverball. Be sure to check them out! 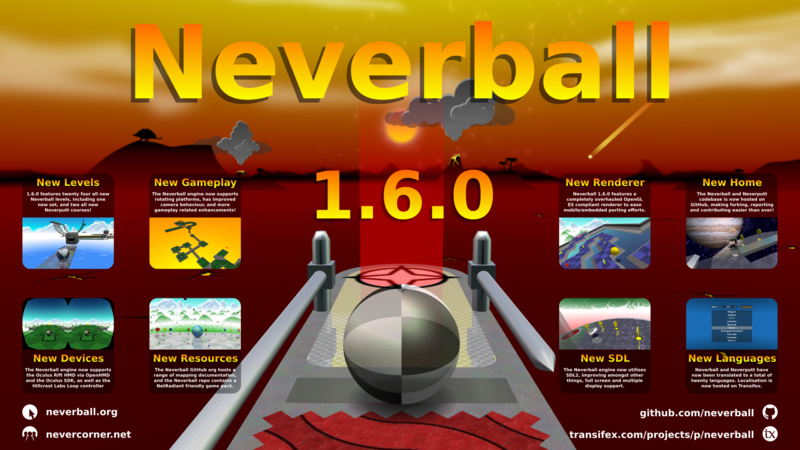 Neverball is known to run under Linux, Windows, FreeBSD, and Mac OSX. Hardware accelerated OpenGL is required. A modern processor is recommended. Visit the Neverforum to get in touch with other players and contributors. We are also on Reddit, Github, and Steam. Players interested in trying their hand at level creation are encouraged to read through the level design documentation. Levels of sufficent quality may be included in the next version; authors will be credited in-game.